To be a catalyst for the redevelopment of the Lower 9th Ward, by building a neighborhood with safe and healthy homes inspired by Cradle to Cradle thinking with an emphasis on a high quality of design, while preserving the spirit of the community's culture. The Make It Right Foundation is a non-profit foundation founded by Brad Pitt in 2007. The foundation was established to aid in the environmentally friendly rebuilding of New Orleans' Lower 9th Ward after Hurricane Katrina. The organization is currently working in New Orleans, LA, Newark, NJ, and Kansas City, MO. Photographic portrait of Brad Pitt from Blake Nelson Boyd's "Louisiana Cereal". In December 2006, Brad Pitt and William McDonough together with Graft Architects founded Make It Right to rebuild 150 safe, energy-efficient and affordable homes for families from New Orleans Lower 9th Ward who lost everything to Hurricane Katrina. As of April 2013, Make It Right has completed 90 homes and is working to finish the remaining 60 homes. The homes in New Orleans were designed by world-renowned architects like Frank Gehry, David Adjaye and Shigeru Ban and each home is LEED Platinum certified by the USGBC. These houses are not typical of New Orleans with their angular shapes and colors of every shade. Make it Right also implements the Cradle to Cradle method which means using material that can be reused and that are safe, renewable energy is utilized, safe drinking water, and improvement is continuous. The Make it Right website uses the idea of Laboratory and Library to show how the materials, the construction, and the data available are certifiably green and will ultimately benefit the homeowner. Some of the topics include: Advanced Framing, Electrical Systems, Pervious Concrete, Paint, Solar Panels, Plumbing, and Quality Control. These homes use 70% less energy than a conventional home of the same size. It takes about $150,000 to build these homes with labor included. If the costs exceed the estimated price then the foundation covers the fee. Each home gives the builder an idea of how to make the homes more affordable and better constructed. Make It Right partnered with HelpUSA in Newark, NJ to build a 56-unit multi-family building for disabled veterans. The LEED Platinum building opened on Memorial Day 2012. In Kansas City, Make It Right is converting an historic school into 50 affordable rental units for veterans, seniors and people with special needs. The building will also include a community center featuring an auditorium, gymnasium, locker rooms, technology lab, job training center, medical clinic, grocery store and other retail space, along with community gardens, a playground, walking trail and police foot patrol office. To build safe, Cradle to Cradle inspired homes, buildings, and communities for people in need. The members of the Make it Right team strive to build homes that are energy efficient and most importantly, healthy and safe for families to live in. The foundation uses methods that are sustainable and affordable. Make it Right donors are giving people a safe place to live, promote sustainable living and solar energy, and help those in need of reconstruction after natural disaster. Some options of donation are green gifts which include: solar panels, paint, native plants, Energy Star appliances, and more. Average energy bills have decreased for the homeowners because of the green technology installed in the Make it Right homes. The homes were initially only available to those whose homes were leveled from Hurricane Katrina but now the green homes are now accessible to teachers and first responders. Lower Nine residents are still eligible and but now the program is extending the offer of housing to others. The foundation also employs lawyers, social workers, and loan workers to help the former residents of the Lower Ninth Ward whom many of which lost all documentation during Hurricane Katrina to get through the mortgage application process. The income of the applicants does not affect the applicant's ability to obtain a home. The unsubsidized mortgage is designed to be no more than one third of the applicant's income. In addition to Brad Pitt, the following celebrities are also involved with the Make It Right Project: Angelina Jolie, Ellen DeGeneres, Kanye West, Drew Brees, Aziz Ansari, Rihanna, Seal, Oprah, and Mike Holmes. On March 10, 2012 at the Hyatt Regency New Orleans, Brad Pitt and Ellen DeGeneres hosted "A Night to Make It Right" with Drew Brees and Randy Jackson and performances by Rihanna, Sheryl Crow, Seal, Kanye West, Snoop Dogg, Dr. John and other local favorites. 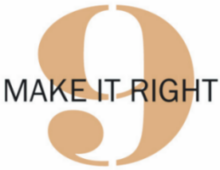 Make It Right raised $5 million at this event, according to the New Orleans Times-Picayune. Just over 1,200 attendees paid between $1,000 - $2,500 to dine on a four course meal created by celebrity chefs, Emeril Lagasse and John Besh. A silent auction also helped contribute to the funds of the Make It Right foundation. The foundation came under fire in early January 2014 after over two dozen of the green homes built started exhibiting severe signs of rotting. The foundation reported that the homes used special wood products called TimberSIL which is advertised as free from many of the toxic ingredients. The wood was unable to withstand the extensive moisture that engulfs the city of New Orleans. The foundation announced they are prepared to pursue all legal remedies if necessary. In 2018, it was reported that residents of the New Orleans Make It Right homes were complaining that many of the Make It Right homes were rotting and dangerous. They complained of mold and collapsing structures, electrical fires and gas leaks. The residents said the houses were built too quickly, with low-quality materials, and that the designs didn’t take into account New Orleans’ humid, rainy climate. Also, it was reported that Make It Right had not built a home, filed tax forms or updated its website since 2015. The downtown New Orleans office had been closed, the staff had been cut to a handful and residents said their calls went unreturned. ^ VolunteerMatch. "Make It Right Foundation". VolunteerMatch. Retrieved 6 January 2014. ^ a b Make It Right Foundation. "Financial Statements - 2012 Audit" (PDF). Make It Right Foundation. Retrieved 6 January 2014. ^ "History - Make It Right". MakeItRight. Retrieved 6 January 2014. ^ Pogrebin, Robin (December 3, 2007). "Brad Pitt Commissions Designs for New Orleans". The New York Times. Retrieved 5 June 2018. ^ Thomson, Katherine (January 1, 2009). "Brad Pitt "High" From New Orleans Project". The Huffington Post. Retrieved 6 January 2014. ^ Bernstein, Fred (November 25, 2009). "Brad Pitt's Gifts to New Orleans". New York Times. Retrieved 6 January 2014. ^ Lee, Evelyn (2008-09-11). "Brad Pitt Breaks Ground in Louisiana with 'Make It Right' Read more: Brad Pitt Breaks Ground in Louisiana with 'Make It Right' | Inhabitat - Sustainable Design Innovation, Eco Architecture, Green Building". Inhabitat. Retrieved 6 January 2014. ^ Lee, Ashley (January 3, 2014). "Brad Pitt Charity's Post-Hurricane Katrina Homes Rotting (Report)". The Hollywood Reporter. Retrieved 6 January 2014. ^ Merriman, Rebecca (January 2, 2014). "Brad Pitt's Charity Under Fire After Hurricane Katrina Houses Begin". Entertainment Wise. Retrieved 6 January 2014. ^ Fox News (January 1, 2014). "Brad Pitt charity under fire after Katrina victims' homes begin to rot". Fox News. ^ Thompson, Richard (December 30, 2013). "Wood product said to be rotting in 'green'-built homes". The Advocate. Retrieved 6 January 2014. ^ Dicker, Ron. "Rotting Wood Reported In Katrina Homes Built By Brad Pitt's 'Make It Right' Foundation". The Huffington Post. Retrieved 6 January 2014. 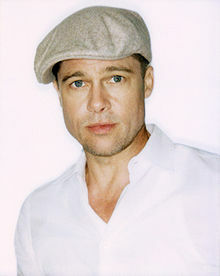 ^ "Brad Pitt's housing foundation considers legal action". 3News. January 4, 2014. Retrieved 6 January 2014. ^ a b c "Brad Pitt built dozens of homes in New Orleans after Katrina. Now they're falling apart and residents are suing". NBC. 12 September 2018. This page was last edited on 3 January 2019, at 15:58 (UTC).